Audiences dressed in their Diwali finery flocked to see Prem Ratan Dhan Payo, and Sooraj Kumar Barjatya’s film is meant just for this bling-hungry crowd, their lust for opulence fuelled by overdressed, haveli-dwelling TV stars, and rows and rows of boutiques sprouting everywhere, selling cut-price version of costumes the actors wear on screen. PRDP does not even pretend to have a coherent screenplay and when there’re two Salman Khans why bother about a proper story? So Vijay Singh is the proud, tradition-bound prince whose coronation is a few days away, when there is an assassination attempt on him. He is travelling in a chariot, by the way, not one of his vintage cars. His lookalike, a nautanki actor Prem Dilwale, along with sidekick (Deepak Dobriyal), is installed his place by the kingdom’s loyal Diwan (Anupam Kher), till he is able to find out who attacked the prince. It would not take half a brain to figure that out, but nobody uses their grey cells in this film. Vijay Singh is a grumpy chap, with a “weak digestion”, seething half siblings, Ajay (Neil Nitin Mukesh), Chandrika (Swara Bhaskar) and Radhika (Aashika Bhatia), plus an obviously evil manager (Armaan Kohli). Prem is persuaded to impersonate the prince, because he has a soft spot for Princess Maithili (Sonam Kapoor), whom he once saw descending from a helicopter, smug smile on face, to help flood victims. Nobody likes Vijay, but his fiancée Maithili has a long list of complaints against him, which, of course, Prem tackles. He also brings the sulking family together, by giving away wealth that isn’t his to give in the first place. 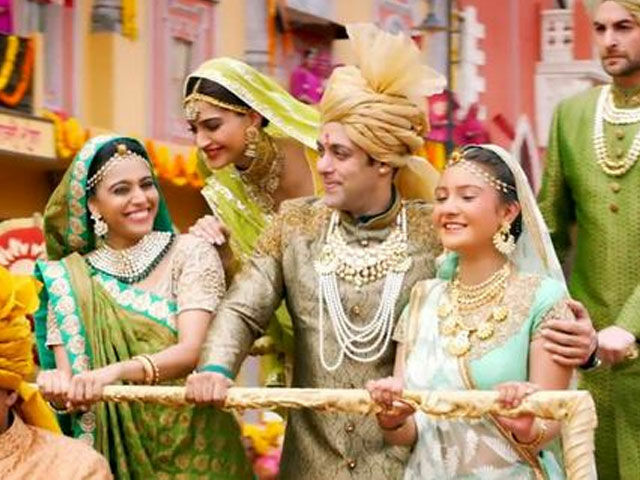 All the film does is unleash Salman Khan’s charm, set against so much tasteless glitz that the eyes hurt. He plays yet another happy-go-lucky, golden-hearted version of Bajrangi Bhaijaan. He can probably do this kind of Dilwale role without straining a muscle. Sonam Kapoor plays the giggly, vapid princess, minding her ‘look’ more than her performance, which is completely bland. Every other actor is reduced to junior artiste, with hardly any character development; not even a villain powerful enough to stand against two Salman Khans! Lots of song-and-dance, but not one hummable number. Barjatya set out to make an old-fashioned raja rani fairy tale, but set it in modern times, where it sits uneasily, dripping ‘sheesh mahal’ kind of artifice. However, the main purpose of dazzling the commoners has been achieved. The crores are in the coffers.